Inspired by a helpful post from Ron Edmondson sharing candid confessions of a church leader, I decided to offer a few from a specifically preaching point of view. 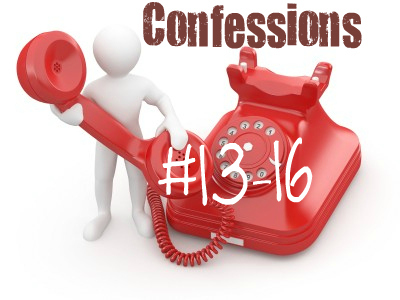 I’m sure there is much more that could be added, but one thing that has come back to me via conversations around this theme is that preachers definitely need to have some genuine and vulnerable relationships, as listed at number 14 – safe places to be able to confess more than is being confessed here. For now, let’s get up to the number 16 . . .
13. Most preachers will freely admit that we face the same temptations and seasons of spiritual dryness as everyone else. We need loving accountability and fellowship, but sometimes struggle to ask for it. 14. Most preachers are like everyone else and need some good close friends to be open with and mutually interdependent. Some preachers think they don’t need that kind of friend, but they do too. Actually many preachers feel lonely, both as preachers and as individuals. 15. Many preachers recognize that our spouse can have the toughest position in a church. They feel all the unresponsiveness to our ministry, and any critique of us, even more keenly than we do. And then they have all the dynamics of their own relationships too. Some churches do foster unrealistic expectations of spouses. 16. Many preachers love God and His Word and His people and the lost. Many preachers love the privilege of preparation, poring over His Word in need of God’s work in our hearts and looking to serve Him as He works in theirs; and the short-term roller-coaster of daring to dream and praying for life changing, even eternity changing moments where God breaks in; combined with the long-term adventure of seeing God at work in peoples’ lives as a process as well as a crisis. It is this privilege of participation in the greater work of God’s great church project that drives us on, stirs our hearts and keeps us pressing on, even in the midst of some pettiness or political brokering or perpetual politeness. Being involved in preaching ministry is a privilege, even when it isn’t always a pleasure. Great series Peter! You hit the nail on the head- sixteen times.